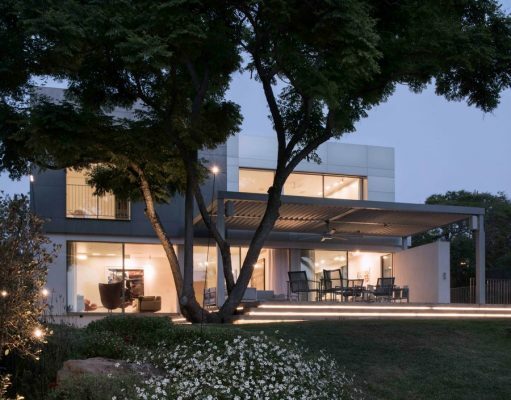 Located in one of central Israel’s earliest communities, and sitting on a hilly 1000 m² plot, this home was created for a young family of 5. The planning came out of a fruitful dialogue with the residents who dreamed of a functional, clean, flowing space with a strong connection to the outdoors; one that matched their character and style of living The goal was to create a home that felt light in perception, the strategy then was to design two main masses: A ground floor white box foundation, to the 2nd story aluminum enveloped “blocks” which it supports. These top story blocks were subdivided: One towering, metallic gray square, and a second larger block that was blanketed in silvery-white natural colored aluminum. 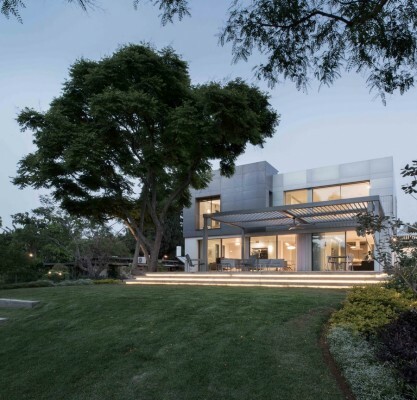 Aluminum was chosen for its minimalist connotations, and coating the top story only, emphasizes the lightness of structure and its differing masses. It also allows for an endless array of light and shadow play on its metallic surfaces. 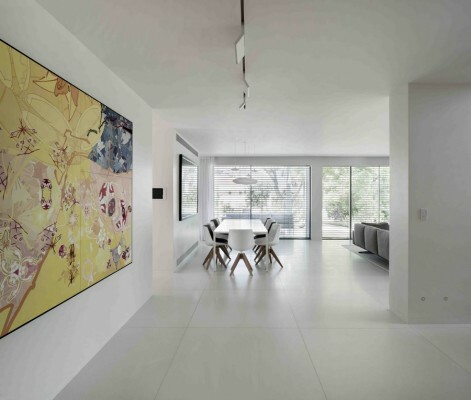 The minimalist design language translated to airy spatial design; one that is uncrowded and light filled. This was facilitated by an index of natural materials such as: Exposed concrete, Terrazzo, aluminum, stainless steel, wood and plaster. These materials were used in the homes interiors and spilled out on to the surrounding grounds. The clients wanted a homewhere contact between parents and children would be easily maintained. They also requested abundant vantage points between the interior spaces and separate floors as well as between the interior and the outdoors. For this reason the house was choreographed as a sequence of spaces that have an open dialogue among each other on the interior. As well as a strong dialogue between the interior and exterior. View from entrance towards the stairs, dining and living area, exhibiting the use of exposed concrete, wooden stairs, white terrazzo floors and natural aluminum mulleins that create an airy, minimalist space. 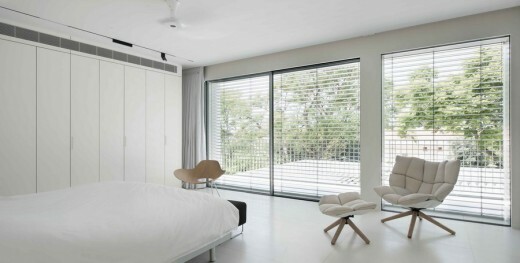 A singular wall serves as a floor to ceiling screen. This allows for separation between the dinning/living room and family room on one hand and the flow of space on the other. Shared floor to ceiling glass doors between these spaces, allow a continuous view and seamless connection to the outdoor grounds. The living room continues to an outdoor canopied living space. The canopy here has adjustable aluminum panes that control the amount of direct sunlight allowed to enter. 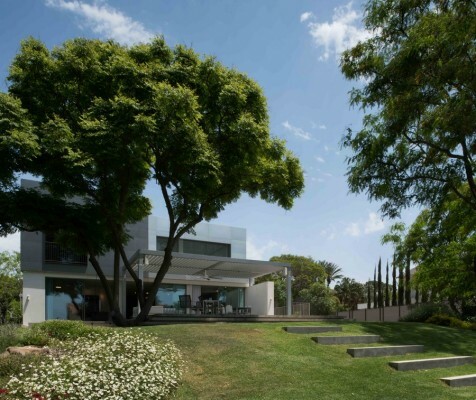 In Israel’s bright and sunny climate this is crucial for the space to be enjoyed year round. From this outdoor living area the green grass rolls down-hill all the way to the ground limits. The family living quarters are located on the upper level: 3 Bedrooms a master suit and family room. Although this is a more private space, it was important to keep a continuous connection to the outdoors here as well. The family living quarters are located on the upper level: 3 Bedrooms, a master suit and family room. Although this is a moreprivate space, it was important to keep a continuous connection the outdoors here as well. To maintain the spatial and vantage flow, an additional family area was designed “in the corridor” housing a wide picture window, allowing both the vista and light to enter the transverse spaces. 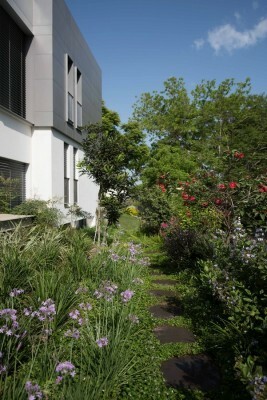 The master suit faces the main garden and has aglassfaçade through which the “outdoor living” feeling is strengthened. A balcony following the length of the suit allows for intimacy while still being able to watch over garden activity. The raised topography on this plot demanded elaborate landscape development to create the smooth flow between the pinnacle on which the house stands and the lowest point at the far end of the grounds. The garden has a child friendly appeal designed around a grassy hill that is framed by regional Mediterranean plants and vegetation. These are colorful and variable by season and also provide a visual contrast to the rolling, monochromatic green of the grass. 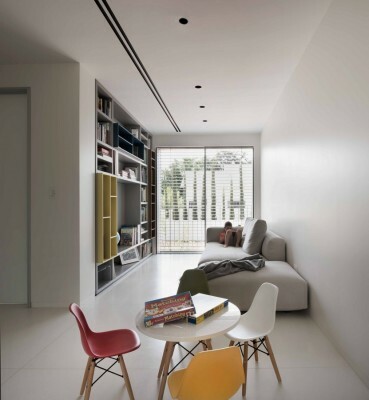 Finally, color was introduced to the interior through art and select furniture pieces. Headed by Architect Tal de Lange and Industrial Designer Chanan de Lange, This is a multidisciplinary studio that specializes in projects of educational, environmental, social and cultural significance. Along with their team the de Lange’s have acquired years of experience in design of permanent and temporary museum exhibitions, visitor centers, science buildings, and science exhibitions. Some of the more prominent works include: Yad-Vashem Museum in Jerusalem, The Jewish Pavilion – Auschwitz, Poland, & The Weizmann Institute’s science park. They also served as consultants for the Israel Museum Renewal Project in Jerusalem, and planned 4000 m² of exhibition space for this same project. 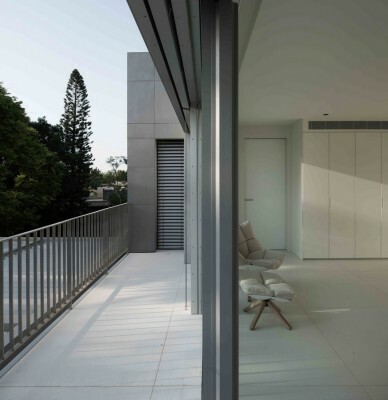 The combined expertise of the founders’ fields, allows the studio to participate and take charge of projects on both the macro level where architectural space planning, building detail & Interior design skills are essential and down to the micro levels of materials and object creation in accordance with project needs. 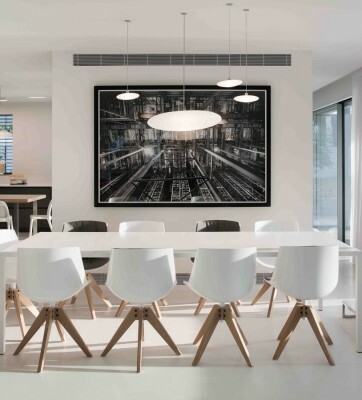 The studio is also experienced with Architectural planning and interior design of high end residential homes and offices in Israel and abroad as well as planning and development of products and ONE OF furniture pieces. Studio de Lange has won several competitions, some of which have been realized and made open to the public, e.g. planning the 20,000 m² permanent exhibition in the Nitzana solar park, Israel, and Israel’s national electric company’s visitor center. The success of these projects lies in the Studios collaboration with experts from various fields, from scientists to artist, who are involved in the creative process. All participating in the quest to carry out the studio’s vision for discovery inspiring design.